How did this happen in 2015 Glamour Magazine? Well this is a lesson in PR if ever I saw one. Unless you are creating a witty parody on what not to do in a situation, the likes of which you see successfully done in Vanity Fair and Tatler, then this sort of article is just asking for trouble. There is a PR lesson here. ‘Epic fail’ are the words that spring to mind, but it’s all about how you recover. I mean, try not to make these mistakes in the first place, but if you do it’s time for some crisis management to take place to rescue or limit damage to your reputation. Your reputation is very important don’t underestimate its power, protect it to protect your integrity and the trust between you and your stakeholders. 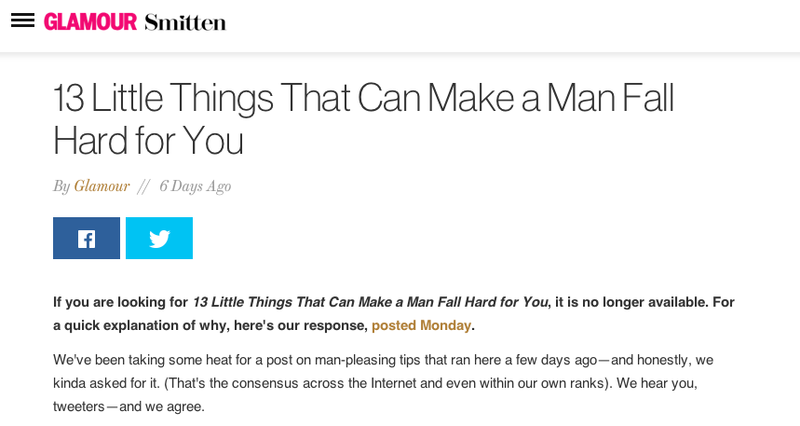 So if you missed this, I’d like to draw your attention to the outrageous article posted by Glamour Magazine entitled ’13 things that can make a man fall for you’. As if modern dating isn’t hard enough than offering some ridiculously manipulative tactics to ‘lock down’ a guy (their words not mine!). Anyway, angry girl rant over. Vice, in response, wrote a very funny article totally shredding Glamour to pieces, well done Vice. It was mockery at its finest and my oh my they had some material to work with. Read Vice’s article, which includes the original Glamour article. Vice puts Glamour in it’s place! Glamour in response to the online back lash they received from the general public and other publications such as Vice, removed the article and replaced it with a pretty good apology, openly admitted their fault. Read what the Glamour article now says. When you are in a crisis and are caught very clearly red handed, then being honest and saying sorry can stop the back lash in its foot steps. Clear, honest and concise communication goes a long way. It was also dealt with swiftly, time is of the essence. 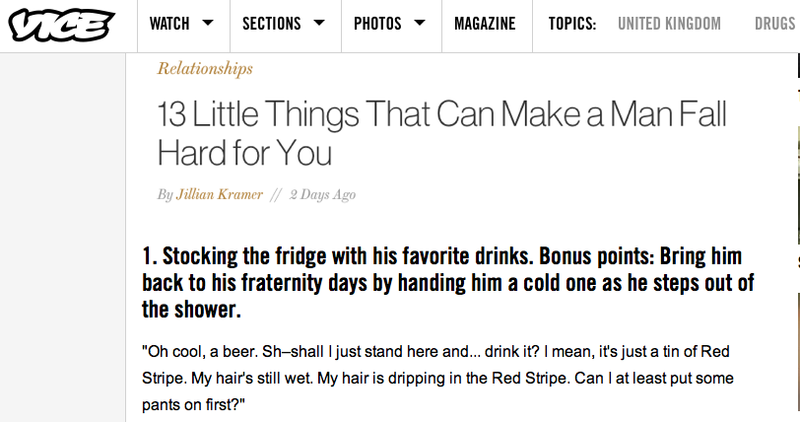 I think my biggest question is why did Jillian Kramer write this for Glamour in the first place? Was she given a brief – just another page filler? Or did she come up with the idea? Did no one really think this would not cause uproar amongst the female population? How did this make it past the editors? This really concerns me when it is a popular magazine with so much influence on a young female demographic. What are your thoughts? Save things to read later on Facebook!